Why Upgrade from Sage 200 to Sage Enterprise? Sage is a natural and popular choice for small business owners looking for an accounting solution. If you are one of the many customers on Sage 200 then you know what to expect with Sage; reliable, accurate and secure financial management. But did you also know that Sage caters for enterprise level organisations with their flagship business management solution, Sage Enterprise Management (formerly known as Sage X3)? Traditionally thought of as a company that mainly deals with small businesses, Sage Enterprise includes everything you would expect from Sage but with a whole host of added features and benefits that can hold up against any global ERP solution. Sage Enterprise is Sage’s largest and most fully comprehensive ERP solution, and shows how there is a Sage solution for every step of your business journey. If you are currently using Sage 200 then Sage Enterprise is the logical next step. Your team will be used to the Sage brand and already be comfortable using a Sage solution. Your processes and data are also likely set up in a way that will suite Sage Enterprise, and be simple to transfer across. But how do you know if you need to upgrade your current solution? You need smarter financial management. It’s no longer enough to simply be processing your invoices and purchase orders, you want to be able to see where you can make cost savings, drill into why some months are more successful than others and ultimately be armed with the information and data to accelerate your business growth. You’re no longer a single entity. 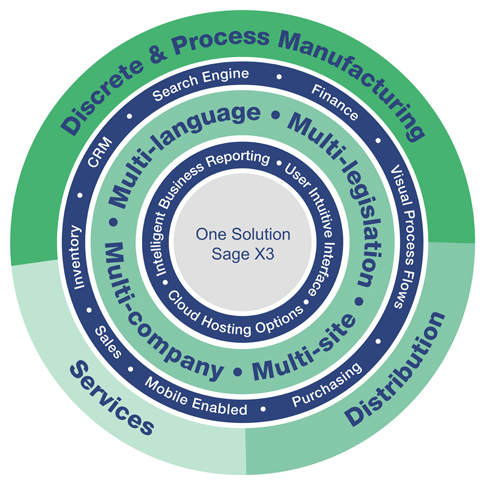 Your company has multiple sites, whether it be a head office and a manufacturing/ distribution plant in the UK, or a UK, European and American site, Sage Enterprise can handle it all. The solution is multi-site, multi-currency and multi-legislation; handling all your current business needs and equipped with the functionality to grow with your organisation for years to come. You have a complex or unique way of managing your business. You may be used to having to change your processes to fit out of the box software, but why should you have to? Sage Enterprise is flexible enough to be tailored to your specific business processes, working exactly how your company requires it to and not the other way round. You’re running multiple systems for different areas of your business. You have one system managing your manufacturing process, another for finance and yet another for stock control. They may all be integrated but this is never going to give you the same level and depth of insight into your data as one unified solution. You need a clear view of your business performance. Sage Enterprise can manage your whole business, from purchasing to CRM, and everything in-between. You also gain a much clearer view of your whole operation, you can see how you are performing globally whilst also drilling into the data of each individual site. And the best part? This can all be accessed real-time, from your phone or tablet. Is Sage Enterprise Management Right For You? In a nutshell, Sage Enteprise is typically suitable for companies with over 50 employees with more than 10 million turnover. It is highly flexible and configurable so if your business is smaller than this, but has complex requirements and ambitious growth plans, then it could still be the right solution for your company long term. If any of the above ring true then it could be time to take a look at Sage X3. If you’re still unsure whether Sage Enterprise is right for you then watch our free demo videos to see the solution in action.